Mission: To train leaders of the field of Hip Surgery and Joint Preservation through innovation, research, education, at a clinical center of excellence. 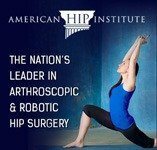 Fellows will be trained in all aspects of hip preservation surgery, and will gain a unique foundation in complex hip arthroscopy. Training will focus heavily on minimally-invasive techniques for treatment of labral tears, FAI, subspine and ischiofemoral impingement, dysplasia, and microinstability. This highly specialized fellowship prepares trainees for a focused niche practice in Hip Preservation. Fellows with academic interests benefit from the strong research program, based in a collaborative, learning environment. The fellowship is ideally suited for trainees graduating from a sports medicine fellowship who wish to obtain further training in a second fellowship. However, application is also open to graduating residents.